.... well, after having finally decided, to re-complete my set to all three of them, just too outstanding to not have them all. I've got 2 of the 3, the 125mm and 180mm. I just can't get excited about the 90... The 58mm and 40mm, on the other hand, are on my wishlist. The 58 escpecially. I only have the 125mm, in native EOS mount. I can say that photozone's review is very accurate. 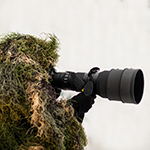 It is one of the best lenses I have ever used/owned and to me it is a huge value lens; it replaced my macro lens and every other 135mm lens that I owned, including the 135L. The 58 is not all that interesting to me because I already own the 58/1.2 Rokkor. The 90 is interesting, but could never replace my 85 and wouldn't really add anything except weight to my bag. The 180 is not interesting because I really have little use for that focal length. The 40 is one that I'd really like to try. You and I share a common issue with the 90 - I've got it covered with a couple of other lenses I'd never part with. The 180mm has become my long travelling lens. It's tiny and has the color, sharpness and bokeh of the 125mm. It also focuses quite closely. If it came in a native EF mount, I'd probably use it more than my macro. At some point, I'd like to get an m4/3 camera. I think the 40 Ultron would be a perfect lens for me with that setup. Use on my Canon's would be a bonus. I have all of them and have used for last two years. They are all great optics, good contrast, sharp and have good coating. Very good modern lenses with MF, and good construction - full metal. Good point of 90 and 180 is that they are small. And finally: 90 minimum apperture is f3.5 and 180 is f4. Even if they are sharp from begining, BOKEH is not so nice. Vivitar 90 Series 1 has nicer bokeh at f5.6 than Voigtlander 90 at f3.5 - it is my personal opinion. Similar situation is with voigtlander 180 comparing to Leitz 180/2.8. So if someone needs small and sharp lens - vls90 and vls180 are for you. standard filter thread mount, so any right sized sunshade fits. Shortly, I will have an opportunity to try my 90/3.5 and 180/4 APO-Lanthars using both a Nikon D3x as well as a Nikon D3s. If there is anything in particular you are interested in I can do some pixel-peeping, just let me know in advance what areas interest you. The 58 is not all that interesting to me because I already own the 58/1.2 Rokkor. The 90 is interesting, but could never replace my 85 and wouldn't really add anything except weight to my bag. A Canon FD 85/1.2 SSC Aspherical and a CV 90/3.5 are really not the same sort of lens at all, except for having similar focal lengths. The typical apertures at which they are used are quite different. One is a fast lens with all the advantages and drawbacks of a fast lens, likely used at apertures less than or equal to 2.8; and one is an extremely well corrected lens mainly used between f/5.6 and f/11. I do encourage you to give the cv90 a try. Its not a fast 85 replacement; its a different lens entirely. Yes, its certainly a very interesting lens. I assume the pink elements are ED glass or somesuch. In the same focal length I only have the Nikkor 70-200/2.8G, I think it should not be penalized of being a zoom lens and one f-stop faster. Well, perhaps someone who reads Japanese can tell us what it says. Esox lucius: Thanks, really good result! Background bokeh is also very nice. YES, it is. Guess where the name "Lanthar" comes from?? Natural Lanthanum is composed of stable Lanthanum mixed with radioactive isotopes. Stable Lanthanum by itself is not radioactive. The first glasses made with Lanthanum contained traces of radioactive isotopes and other elements as well, because it was impossible until the late 1950s to obtain 100% pure stable Lanthanum. Nowadays, Lanthanum glass is made of 99.99% pure stable Lanthanum and therefore has no radioactivity at all. Is there then a chance that the Apo-Lanthar 90 may be radioactive? I have sold my SMC Takumar 1.4/50 for that reason. I'd hate to have to sell the Apo-Lanthar too, but if it's radioactive.... well, I don't want a radioactive lens in my bag or my closet. Nowadays, Lanthanum glass is made of 99.99% pure stable Lanthanum and therefore has no radioactivity at all. related to such quality lenses. Thanks Sebastien, couldn't have put that better!! Even old lanthanum lenses are much less radioactive, than thoriated lenses. Thanks Klaus for the links..
Is there anyone who can help with suggesting stores in JAPAN where any of these lenses can be bought ?